In case you missed it! A week ago we hosted our first live music performance on the outdoor patio at Clark and Lewie’s! 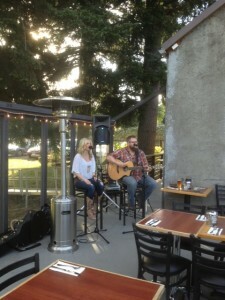 Local Country music singer/songwriter Britnee Kellogg performed acoustically with her guitar player Daniel Friesen. The place was packed! Be sure to stay updated on our Facebook page and ‘The Latest’ on our website, for more local live performances!